The forward price F=Se(r-q)t, where S = stock price; r = continuosly compounded interest rate; q = continuos dividend rate ; t = time to expiration. In Black Scholes, implied volatility is assumed to be the same for all strikes for a given security. In reality however, for a given time to maturity, implied volatility is generally higher for lower strike prices and lower for higher strike prices. Implied volatility varies as a function of time-to-maturity. Typically implied volatility is found to be mean reverting - Short dated implied volatility is more variable than long dated implied volatility. Long a Calendar spread: Buy long dated and sell short dated options (same strike and underlying). Investor in a Long calendar spreads expects long dated option price to increase more than the short dated option price. In other words they expect long dated volatility to increase more than short dated volatility. Short a Calendar spread: Sell long dated and buy short dated options (same strike and underlying). 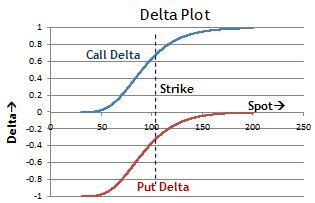 The option delta vs Spot price graph for a European call and put has plotted below. 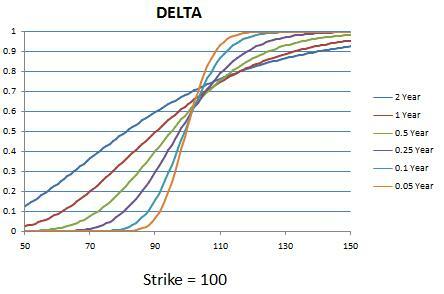 Variation in delta vs Spot profile for a call option with time to maturity is plotted below: (K = 100). 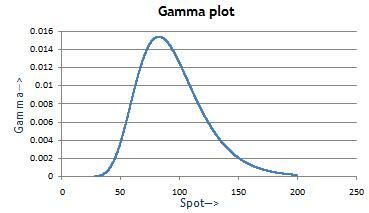 Below is plot of option gamma variation with Spot price. Unlike delta which is bounded between 0 and 1 for a call option and -1 and 0 for a put option, Gamma for a long position in an option can assume any value from 0 to infinity. 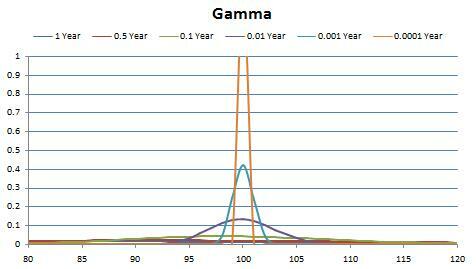 Gamma is maximum for ATM optiona at expiry. 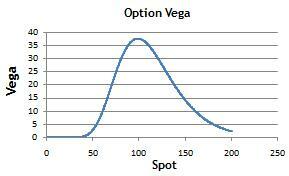 The vega plot plot for European call and put is given below. Theta: Sensitivety of option price with respect to time to expiry. Buying/Going long a skew: Buying low strike and selling high strike options.